Based on true events, the historical gangster flick evolves around the bloody murder of a dog groomer. 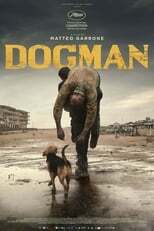 Dogman is directed by Matteo Garrone and was released on Apr 12th, 2019. Director Matteo Garrone's Crime & Drama movie Dogman is produced by Rai Cinema & Archimede & was released 2018-05-17.